Home•60% of iOS App Developers Don’t Break Even! 60% of iOS App Developers Don’t Break Even! There is no shortage of stories about lone developers who made an app for the iPhone or iPad and had runaway success. But in the real world, the majority of app makers struggle to break even, according to a recent survey by marketing firm App Promo. Though the survey’s methodology is a bit on the light side, numerous developers that we spoke to agree that the results—59 percent of apps don’t break even, and 80 percent of developers can’t sustain a business on their apps alone—are close to accurate. Apple encourages practically anyone to try their hand at iOS development. Just $99 per year gives you access to Apple’s developer program, the development tools are a free download, and numerous books line bookstore shelves (both physical and virtual) offering tips to budding iOS developers. While this creates a large developer base for the platform, it also creates a huge group of developers who grossly underestimate the amount of time, effort, and money that can go into developing a quality app. Part of the problem can be attributed to consumer expectations. Whereas $20-30 was not an uncommon price for desktop software created by small developers in the past, the App Store quickly led consumers to expect to pay 99 cents, or maybe $1.99 for most mobile apps. Many more are free, supported with in-app ads or “freemium” in-app purchases. 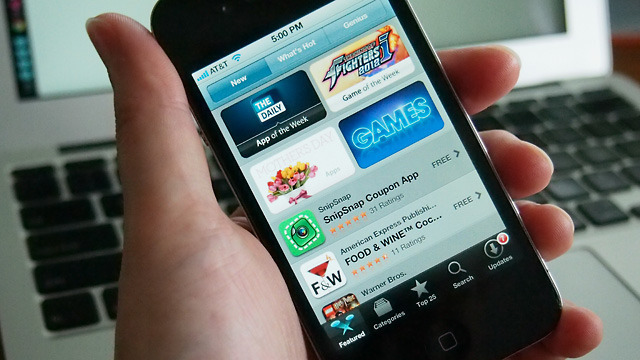 “Paid apps, despite likely being only $1, is a surprisingly high barrier of entry,” McCarron told Ars. Another part of the problem is that Apple has done little to change how the App Store works since day one over four years ago. Discoverability is a real problem, and the search algorithms have led some developers to try and “game” the system with SEO techniques like overloading titles, descriptions, and other metadata with keywords. It’s hard to be the number one search result even when your app name is an exact match for the search terms. Developers agreed that Apple could improve browsing and discoverability, and the company seems to be making an effort to move in that direction. It recently bought Chomp, a service designed to help navigate app stores for various mobile platforms. Apple recently discontinued Chomp’s Android offerings, so it seems likely that tighter integration with the App Store is coming sooner rather than later. “I’ve hit many places where this would have been useful myself when shopping for an app to do a certain task,” McCarron said. He feels that consumers would be more willing to pay $5, $10, or more for an app if they were convinced it would prove useful after having tried a demo. Of course, developers themselves could help by more tightly focusing their development efforts. Many developers are encouraged by the App Store’s “lottery” effect to develop several apps in the hopes that one might be a hit, but they could benefit themselves by honing in on apps that perform their intended functions exceptionally well. “Developers would be better served by investing more strongly in fewer, better apps, trying to build a real business,” Simmons said. 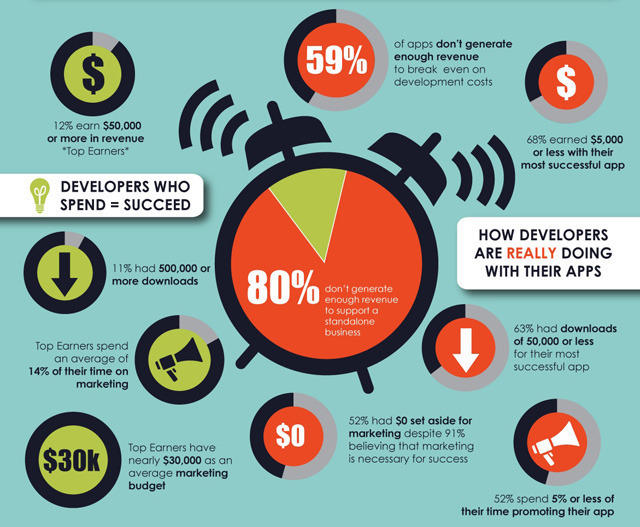 App Promo’s reasoning behind the survey is to show the benefit of marketing to app success—51 percent of developers didn’t set aside any budget for marketing. The developers we spoke to agreed it was critical to fuel early adoption, which could lead to breaking into the top charts. “It used to be easier to get away without spending any money on marketing, but now it’s quite hard to make a dent in the market without that,” McCarron said. “If an app isn’t charting, and it isn’t featured by Apple, the only way users are likely to find it is through the developer’s marketing efforts,” added Kafasis. Even still, success isn’t guaranteed. “It’s no secret that the money in the App Store is the contracts writing the apps, not in selling the apps themselves,” he said.